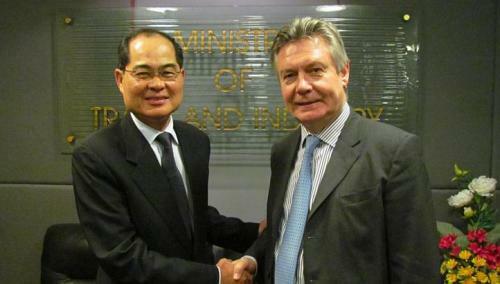 Singapore Minister for Trade and Industry Lim Hng Kiang (left) and European Union Trade Commissioner Karel de Gucht at the successful conclusion of the EU-Singapore Free Trade Agreement negotiations in Singapore on December 16. Singapore as the first Southeast Asian nation has concluded a free trade agreement with the European Union on December 16, seeing the EU eliminating tariffs on all imports from Singapore over a five-year period. The agreement will also remove 80 per cent of all Singapore-EU tariffs, with exporters of electronics, pharmaceuticals, chemicals and processed foods benefiting the most. Both sides were further making extensive commitments that guarantee access to the other’s services markets including the financial services industry. The plan is to put the free trade agreement in place in early 2013. The EU is Singapore’s second biggest trade partner on the region after Malaysia. in 2011, EU-Singapore trade was worth about €74 billion euros or roughly $100 billion. The EU’s trade surplus with Singapore in 2011 was €8 billion, with cars accounting for a big slice of the bloc’s exports. EU-Singapore trade in goods and services each grew by some 40 per cent between 2009 and 2011. Singapore is also Asia’s second largest investor in the EU after Japan. In 2010, the existing stock of bilateral investment between the EU and Singapore reached €190 billion, having expanded rapidly over the past years. “Singapore is a dynamic market for EU companies and is a vital hub for doing business across Southeast Asia. This agreement is key to unlocking the gateway to the region and can be a catalyst for growth for EU exporters”, EU Trade Commissioner Karel De Gucht said in a statement after the agreement was signed. The EU already has signed a free trade agreement with South Korea which is operation since July 2011. The bloc is also conducting negotiations with Malaysia and Vietnam, as well as preparatory talks with other ASEAN nations. The EU says it considers free trade agreements with individual ASEAN countries as stepping stones towards a region-to-region agreement, which remains a long-term objective.